Founded in Riverside, Calif. in the early 1960s by Ken Johnson and Norm McDonald – both now retired – with an initial emphasis on motorcycle and championship-caliber off-road and track racing products, K&N (for Ken and Norm) has expanded over the years to encompass a 400,000-sq.ft. complex of 10 buildings. Facilities are also located in England and The Netherlands, with the company marketing 5,000-plus products into more than 30 nations. With a lineup aimed at cars, standard and heavy duty trucks, SUVs, motorcycles, ATVs, UTVs, snowmobiles, watercraft, agricultural and earth-moving equipment, outdoor power equipment and other applications, K&N’s in-house operations include engineering, product design, manufacturing, warehousing, test facilities, purchasing, sales, customer service, marketing and corporate offices. The company’s manufacturing capabilities are wide-ranging, such as air filter production, CNC machine shop, tube bending and welding, powder coating, roto-molding, carbon fiber production, air intake assembly, packaging and related fabrication. Several initiatives are being developed – including point of sale materials, an Authorized Dealer designation for participating shops and a motorist-based media campaign – to position the company’s products as the primary filter brand carried by the installer channel. Covering all makes and models, “the financial benefit to the shop owner is increased margin when selling our filtration products.” And being able to offer the peace-of-mind guarantee “allows the shop to charge a fair price appropriate for an ultra-premium product,” Grau notes. Individual repairers can accumulate desirable “K&N points” under the Professional Technicians Rewards program. 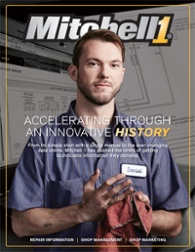 Only here can you read the unique history of Mitchell 1 and see how the company is accelerating through the coming years to bring more services and features to automotive pros. The company’s Local Market Planning effort consists of working with WDs to assist them in identifying growth opportunities among area fleets and service centers. “We meet with our customers to establish a joint sales target for the year. During this meeting we also establish our plan for the year relative to field support, promotional calendar, training programs and new business targets,” Grau reports. “We implement the program immediately and schedule quarterly business reviews to review our progress and implement corrective actions if appropriate. As a premium filter supplier, this program is helpful to reach our customers’ sales and margin objectives for their filtration program. Grau says K&N tries to support WD customers with strong field support. The K&N team makes calls on service providers and fleets on behalf of its customers. "We also offer the market an exclusive product lineup that can only be purchased through traditional warehouse distributors. Additionally we have a unique pricing system to simplify the sales process throughout the distribution channel,” he adds.